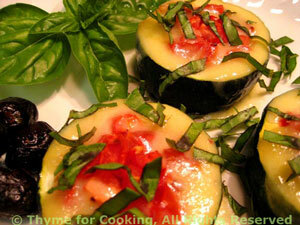 Warm Zucchini (Courgette) Cups with Tomato, Thyme for Cooking easy starter. Little cups are formed by scooping the seeds out of thick slices, but leaving a base to hold the stuffing. A bit of cheese is added for the last few minutes, to just melt and bubble around the edges. Healthy and pretty! These would be great for a party, as all the work could be done ahead, and then baked at the last minute. Cut the zucchini into six 1 inch (2.5cm) rounds. Using a teaspoon scoop out the center of each round leaving 1/4 inch (.6cm) on sides and bottom. Discard 'trimmings' - there won't be much and zucchini is plentiful. Dip the bottom of each zucchini cup into oil and put on a baking sheet. Clean and finely slice the green onions. You will want about 2 (heaped) tsp of slices. Divide and put into each zucchini cup. Finely chop the tomato and put on top of the onions, mounding it up a bit to get it all in. Bake in 400F (200C) oven for 30 minutes. While they bake slice the cheese into small thin rectangles, just to makes it easier to work with. Remove zucchini and arrange cheese around the edge of the zucchini trying not to let it hang over the sides and leaving some tomato uncovered (prettier). Remove, arrange three on each plate, sprinkle with basil, garnish with olives and serve.